Matt Ryan is coming off an impressive 30.7-point performance against the Panthers defense, and now squares off against the Saints, who have shown they are vulnerable. The Falcons will be at home and the game currently has the third-highest team total of the week. This one could be a shootout and Matt Ryan should be started with confidence moving forward. The Buffalo Bills are a terrible team this year and opposing teams are able to run all over them: the Ravens and Chargers scored 31.5 and 43.4 fantasy points, respectively, against the Bills who now find themselves against a very tough Minnesota Vikings team. The Bills won't be able to move the ball and this will set up a lot of short-field opportunities for Latavius Murray who leads the way after Dalvin Cook injured himself last week. When will the Fitzmagic end?! Ryan Fitzpatrick is on a roll and has elevated the weekly potential of all his wide receivers, including this week's start,Chris Godwin. His matchup against the Steelers has the second-highest over/under on the week, and this game has another chance to become a shootout. Godwin will be involved yet again and provides a solid option as a WR3 or flex play this week. Jesse James is taking advantage of Vance MacDonald not being 100% and is being trusted by Ben Roethlisberger more than ever before. He's currently ranked as the 2nd-highest scoring tight end through two games and has totaled 198 yards and 1 touchdown so far. This week the Steelers play the Bucs who gave up 15 receptions and 151 yards to the tight end position last week against the Eagles. For those who didn't go TE early or got hit with the injury bug, James is a must play in Week 2. With seemingly how easy the Chiefs move the ball down the field, Harrison Butker is an absolute must start. Through 2 weeks he has 11 extra points - if the KC offense regresses just a little bit and doesn't punch it in for six every game, Butker will start lighting it up on the scoreboard. This week the Chiefs/49ers game has the highest over/under at 56 points - Butker will have an ample amount of opportunity to cross double-digit points this week. 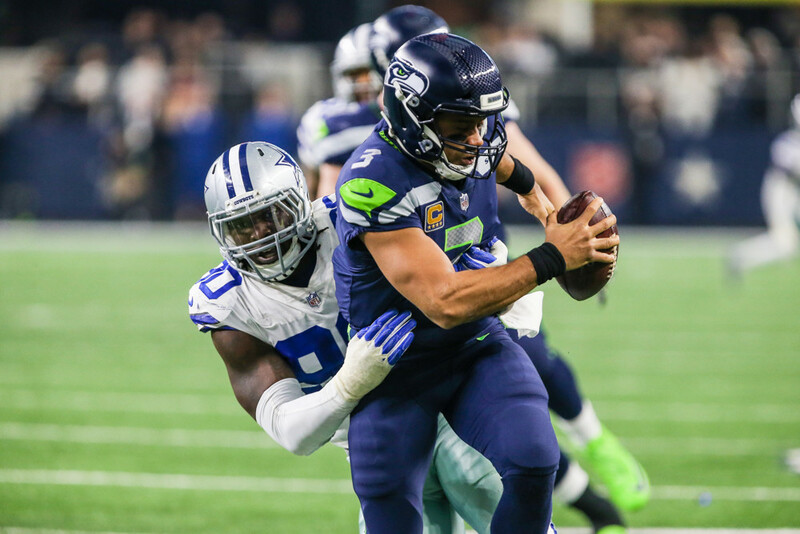 Fire up the Dallas Cowboys defense this week who get to play against a non-existent offensive line Seattle who has given up 6 sacks in back-to-back games to begin the season. The Cowboys D isn't too bad itself, registering 9 sacks and 2 fumble recoveries through 2 games and currently sitting as the fifth-highest scoring defense to begin the season. Why is Philip Rivers a sit, considering he's thrown 3 TDs the first two weeks and scored over 20 fantasy points in both of those games? The Rams defense is the short answer. While Philip has been great, the Rams defense is playing on another level. Through 2 games, the Rams D is allowing a league-best 7.8 fantasy points to QBs. If that's not impressive, the defense hasn't surrendered a touchdown yet, and has 4 interceptions. While Rivers will be good for the rest of the season, this week he should ride the pine. With LeSean McCoy sidelined for at least this week, Chris Ivory and Marcus Murphy find themselves in co-lead roles come Sunday and it couldn't come against a tougher opponent. The Bills travel to Minneapolis and face a Vikings defense that is currently allowing the fifth-least amount of fantasy points to running backs through 2 weeks. If last week's snaps dictate who will have the lead role, it's Murphy, however, he has a large task ahead of him in what will almost certainly be a game in which the Bills are trailing large early. Even though Kelvin Benjamin is the surefire number one target on the Buffalo Bills, when will you ever feel confident playing him? Through 2 weeks he's totaled 3 receptions for 29 yards. Sure, he did score a short-yardage touchdown last week, but is this reliable week-to-week? Absolutely not. Benjamin is a fringe WR3/flex and is trending downward given the matchup against the Vikes this week. Start him this week at your own risk. David Njoku has underwhelmed through 2 weeks of the season. Yes, he is receiving seven targets per game, but at some point, those need to convert into fantasy points. Seven catches for 33 yards and 0 touchdowns is not getting the job done. Njoku can't be trusted this week against the Jets this week and unless we see those targets turn into catches and touchdowns, he's a bench stash or waiver wire drop for me. The beginning of the season hasn't been pretty for Chris Boswell. Through 2 weeks he's scored a total of 4 fantasy points and is 0/2 on field goal attempts. While the potential is there for Boswell to put up a lot of points given the high-powered Steelers offense, Boswell simply can't yet be trusted and is a field goal miss or two away from needing to find himself a new job. While it's not unlikely Boswell could return to form, I'd be waiting for a game where he shows he can deliver. For the second time in as many weeks, the Pittsburgh Steelers defense should not be played this week due to yet another tough matchup against the Tampa Bay Buccaneers. Patrick Mahomes just lit up the defense for 6 touchdown passes last week and while they may have a decent bounce-back game, I expect the 49ers offense to be able to put up their fair share of points while limiting their turnovers.